Last revised 1 November 2005. Gene was born in Chicago, Illinois on March 14, 1934. He received a B.S. degree in Electrical Engineering from Purdue University and an M.S. in Aeronautical Engineering from the US. Naval Postgraduate School. 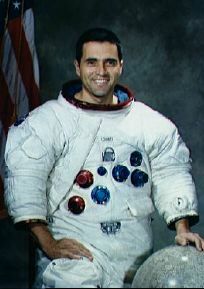 Gene was selected as a member of the third group of astronauts in October 1963. He and Gemini 6 veteran Thomas Stafford were assigned to the Gemini 9 backup crew but became the prime crew when Elliot See and Charles Bassett were killed in an aircraft accident in February 1966. Gemini 9 was launched on June 3, 1966. During their three-day flight, Stafford and Cernan performed three separate rendezvous with an unmanned Agena target vehicle. Gene also performed NASA's second spacewalk, spending two hours outside the spacecraft. As he discusses in his Apollo 17 commentary, the difficulties he experienced demonstrated the need for handholds, footholds, and a high-capacity spacesuit cooling system. After Gemini 9, Cernan served as backup pilot for Gemini 12; and, then, he and Stafford were joined by Gemini 3 and 10 veteran John Young as the backup crew for Apollo 7. In the normal course of crew rotation, they became the prime crew of Apollo 10, with Cernan assigned as Lunar Module Pilot (LMP). Apollo 10 was the final rehearsal for the historic first landing and was flown to check out all spacecraft systems and procedures in lunar orbit. Stafford and Cernan flew the lunar module Snoopy on virtually the same trajectory that Armstrong and Aldrin took two months later. They flew down to 47,000 feet before discarding the LM Descent Stage and flying back out to a rendezvous with Young. 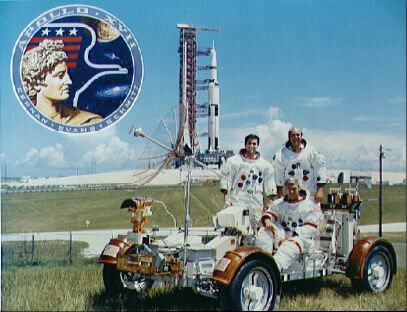 Following Apollo 10, Cernan was assigned to the Apollo 14 backup crew as Commander, with Ron Evans as Command Module Pilot and Joe Engle as Lunar Module Pilot. By the time Apollo 14 was flown, Cernan had become the first and only Apollo astronaut to have trained as both LMP and Commander. 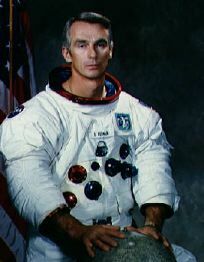 Following Apollo 17, Cernan helped in the planning for Apollo-Soyuz and acted for the program manager as the senior U.S. representative in discussions with the U.S.S.R. He retired from NASA and the Navy, with the rank of Captain, on July 1, 1976, and kept busy as a consultant in the energy and aerospace businesses and as a television commentator. He later served as Chairman of the Board of Johnson Engineering Corporation which provided NASA with Flight Crew Systems Development with personnel located both on and off site at Johnson Space Center. The picture above (S71-51308) is Gene's formal portrait for Apollo 17. Note that, although he is wearing an A7L-B suit, he is also wearing an Apollo 10 patch. Journal Contributor Matt Markham notes that Gene's hair is also right for Apollo 17, rather than Apollo 10. Ron was born November 10, 1933 in St. Francis, Kansas. He was trained as an engineer at the University of Kansas and received a Master's Degree in Aeronautical Engineering from the U.S. Naval Postgraduate School in 1964. 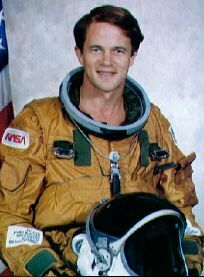 Ron was selected as a member of the fourth group of pilot-astronauts in April 1966. At the time of his selection, he was flying combat operations in the South China Sea - from the aircraft carrier USS Ticonderoga - having previously served as a combat flight instructor. He served on the support crew for Apollo 7 and as the Apollo 11 LM Launch CapCom before his assignment to the Apollo 14 backup crew and, then, Apollo 17. After his lunar flight, Ron served as backup Command Module Pilot for the 1975 Apollo-Soyuz joint flight and then transferred to the Shuttle program prior to his retirement from NASA in 1977. He worked as Executive Vice-President of Western America Energy Corporation in Scottsdale, Arizona until 1978, then as Manager, Space Systems Marketing for Sperry Flight Systems, Phoenix, Arizona, and later as a marketing consultant. He died of a heart attack in Scottsdale, Arizona, April 7, 1990. The photo is Ron's formal Apollo 17 portrait. Jack was born July 3, 1935 in Santa Rita, New Mexico, and grew up in the nearby town of Silver City. He received a B.S. from Caltech in 1957 and then spent a year studying geology at the University of Oslo in Norway. He received a Ph.D. in Geology from Harvard University in 1964. Before joining NASA as a member of the first group of scientist-astronauts in June 1965, he worked at the U.S. Geological Survey's Astrogeology Center at Flagstaff, developing geological field techniques that would be used by the Apollo crews. Following his selection, Schmitt played a key role in training Apollo crews to be geologic observers when they were in lunar orbit and competent geologic field workers when they were on the lunar surface. After each of the landing missions, he participated in the examination and evaluation of the returned lunar samples and helped the crews with the scientific aspects of their mission reports. Because Schmitt was the only geologist in the astronaut corps and, as well, had spent considerable time becoming proficient in the CSM and LM systems, it came as no surprise when, in March 1970, he became the first of the scientist-astronauts to receive a crew assignment. He joined Richard Gordon (Commander) and Vance Brand (Command Module Pilot) on the backup crew for Apollo 15 and was clearly in line to fly as Lunar Module Pilot on Apollo 18. After the cancellation of Apollo 18 in September 1970, many people expected that he would be assigned to fly on Apollo 17, the last lunar mission. That assignment was announced in August 1971. After the completion of Apollo 17, Schmitt played an active role in documenting the Apollo geologic results and also took on the task of organizing NASA's Energy Program Office. In August 1975, Schmitt resigned from NASA to seek election as a United States Senator representing New Mexico. He served one term and, notably, was the ranking Republican member of the Science, Technology, and Space Subcommittee. He was defeated in a re-election bid in 1982 and, since then, has kept very busy as a consultant in business, geology, space, and public policy. In 1994, he was appointed as an Adjunct Professor of Engineering at the University of Wisconsin and Chairman and President of the Annapolis Center for Environmental Quality. NASA photo S71-52260 is Jack's Official Mission Portrait. Gordon was born October 11, 1936 in Rochester, New York; and, while a classmate of Jack Schmitt's at the California Institute of Technology, trained as an engineer. He received a M.S. in Mechanical Engineering in 1958. After graduation from the USAF Aerospace Research Pilot School at Edwards AFB in 1965, Gordon was serving as a test pilot for the bomber operations division at Wright-Patterson AFB when he was selected into the U.S. Air Force's Manned Orbiting Laboratory (MOL) Program. When that program was canceled in 1969, Fullerton and otherstransferred to NASA. Fullerton was a member of the Apollo 14 and 17 support crews, serving as the Goodnight and Wake-up CapCom on Apollo 14 and the lunar landing and lift-off CapCom on Apollo 17. 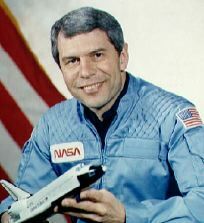 Subsequently, he joined the Shuttle program and was one of four astronauts who flew Approach and Landing Tests in 1977. In March 1982, he flew as Pilot on the third Shuttle mission (STS-3) and, with Commander Jack Lousma, performed the first - and, thus far, only - Shuttle landing at White Sands, New Mexico when poor weather had closed the dry-lake runways at Edwards. In July 1985, Fullerton commanded the 19th Shuttle flight, STS-51F. Later supervised NASA's test flight operations at Edwards and served as a research pilot into the new century. The picture is Gordon's Space Shuttle Approach and Landing test program portrait. Bob was born in New York City on December 14, 1936. He was trained as an astronomer at Amherst College and at the California Institute of Technology where he received a Ph.D. in 1962. After graduation, he joined the Astronomy Department at the University of Wisconsin where, during the 1966-67 academic year, he supervised future Journal Editor Eric Jones, then a first-year graduate student. In August 1967, Bob was selected as a member of the second group of scientist-astronauts. He served as a CapCom for Apollo 15 and, then, for Apollo 17, as the Mission Scientist and EVA CapCom. Later, he was Program Scientist for the three Skylab missions flown in 1973 and, in 1974, received the NASA Outstanding Leadership Medal. During the Shuttle era he flew on two Spacelab missions: STS-9 in November/December 1983 and the astronomy-oriented mission STS-35 in December 1990. Later, he served in a number of senior management posts in the Office of Space Flight at NASA Headquarters, Washington, D.C., including positions as Deputy Associate Administrator (Operations), Director of the Spacelab Operations Program, and Director of Space Operations and Utilization. In 1997, he was selected as the Director of the NASA Management Office at the Jet Propulsion Laboratory (JPL), Pasadena, California. He and his wife, Judy, have five children and seven grandchildren. The photo is Bob's formal portrait for his STS9/Spacelab 1 mission in 1983. Joe was born June 27, 1937 in Crawfordsville, Indiana. He was trained in physics at DePauw University, Greencastle, Indiana, and, as a Ph.D candidate in nuclear physics, at Yale. 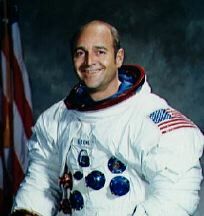 Allen was selected as a member of the second group of scientist-astronauts (sometimes known as the XS-11) in August 1967. He served with distinction as the Mission Scientist and EVA CapCom on Apollo 15 and contributed a great deal of subtle humor to Apollo 17 as the Goodnight CapCom. After Apollo, he served on the staff of the President's Council on International Economic Policy and, from 1975 to 1978, served as the Director of the Legislative Affairs Division at NASA headquarters. He first flew in space in November, 1982 as a member of the fifth Shuttle crew (STS-5) along with fellow Apollo alumni Vance Brand, Bob Overmyer, and Bill Lenoir. He made his second flight, the 14th Shuttle mission (STS-51A), in November 1984. During this flight, he and Dale Gardner made a pair of spacewalks to retrieve two communications satellites which, the previous year, had failed to reach geostationary orbit. Retired from NASA and served as President and Chief Executive Officer of Space Industries International, Inc. in Houston, Texas. 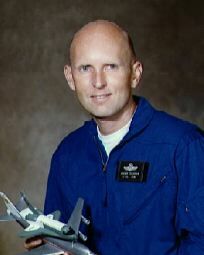 the photo is Joe's formal portrait from his STS-5 mission.